In this short article, I'll present a few observations about the unique "Django style jazz guitars" designed by Mario Macafferri and built by Selmer of Paris. If you own one of these rare vintage instruments or if you have a replica, there should be something interesting here for you. These days we're fortunate to have a wide variety of replicas available in many price ranges - from inexpensive Asian made models to individually handcrafted works that equal or improve on the originals. Whether you call 'em Gypsy Guitars, Macafferri Guitars, Selmers or Django Style Guitars, these are some of the coolest instruments around, and pretty much the only instruments capable of those unique Gypsy Jazz sounds! Being a repairman, the first thing that strikes me about these guitars is that many of them are virtually inaccessible for easy structural repair. Just like the f-hole jazz guitar, I can't get my hand into the soundhole as I would with a regular flat top guitar. Even the famous "Big Mouth" often has a non removable baffle. Speaking of cracks, here's a classic. This crack is the result of dryness, often brought on by extreme heat such as that found in a hot parked car. 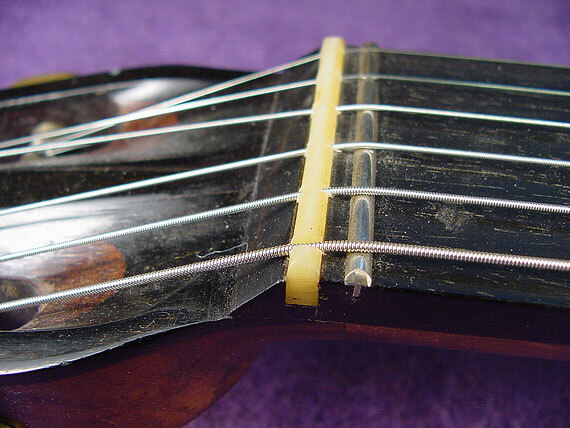 The crack runs along one or both edges of the fingerboard from the neck block all the way to the soundhole. 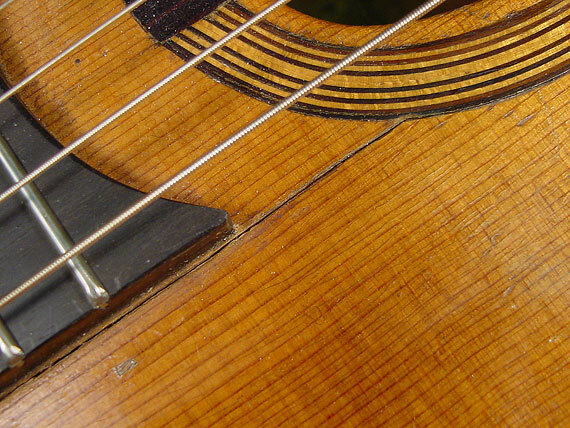 Such a crack threatens the structural integrity of the top, and often allows the sections of spruce to move laterally, allowing the neck to pull forward drastically. Even with this little soundhole, I have room to get in there to add some reinforcement and/or reglue braces under that section of the top to stabilize it. This would be a nasty job indeed if it were the "D-hole" model with the upper baffle firmly glued in place. I'd be forced to remove the baffle, and that can lead to a lot more structural and cosmetic repair. Fortunately, these guitars are not particularly vulnerable to this kind of damage. Notice that the little stamped sheet metal cover is itself part of the mechanism, providing the bearings for the worm gear. The grease inside has turned to the consistency of old dried varnish, so I take the parts off and clean them with mineral spirits. 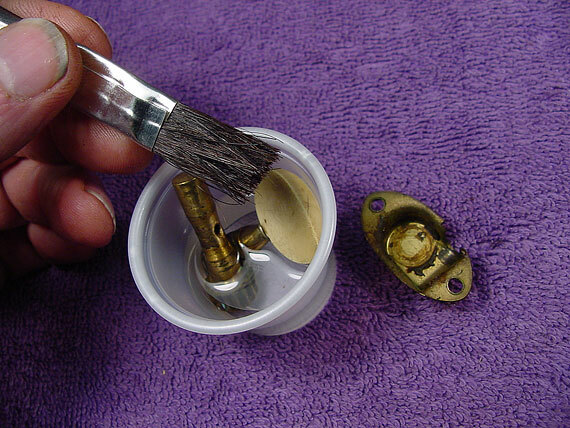 Mineral spirits or naphtha will dissolve the old grease without affecting the plastic buttons. The buttons can be replaced with modern ones if necessary, but I sure wouldn't want to be in need of replacement gear parts! Then, some nice fresh white grease to lubricate all the moving parts, and these old gears will work just as they did when they were new. 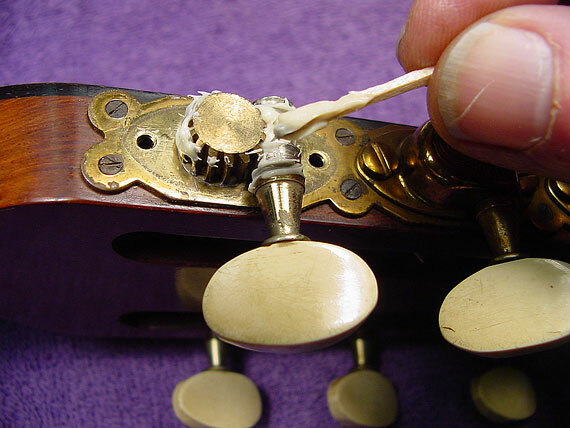 Over the years, I've found that most complaints about uneven and slipping tuners can be resolved by proper adjustment and lubrication. Really, these old tuners should work just about as well as any modern ones. The peghead of this original Selmer is joined to the neck with a traditional splice, which can break in peculiar ways on impact. 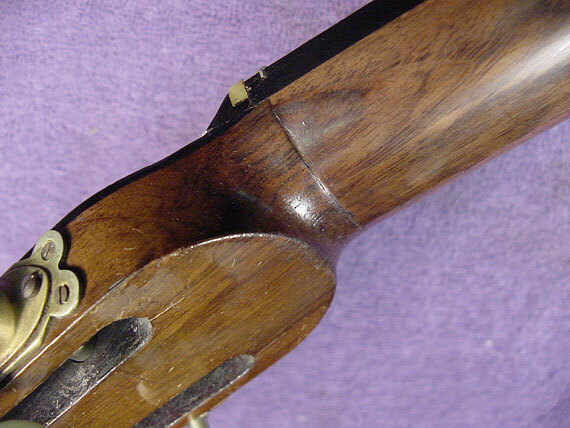 I've yet to see any modern Macafferri replica instruments with such a peghead joint. One can argue that a joint in this position avoids the unfavorable grain direction that occurs in standard one-piece neck design, but I doubt the neck is any stronger built this way. 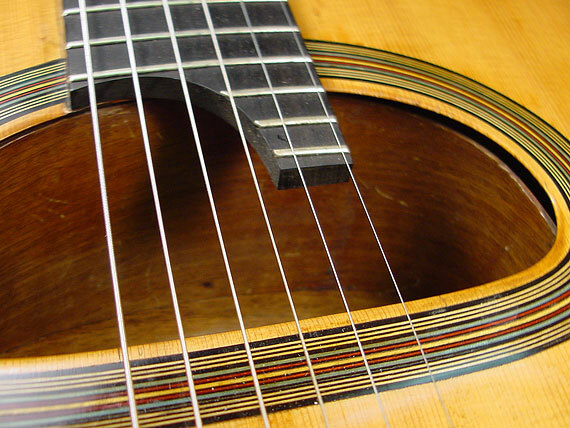 Originals usually have a laminated or "stacked" heel as well, clearly a matter of wood economy common to classical guitar construction. Most of us flatpickers have been brought up with Martin guitars as a standard of reference, so we're used to seeing one-piece necks but Taylor and others are starting to change the image of laminated heels as a sign of inferiority. In fact, jointed pegheads and laminated heels are very old traditional designs and serve very well. 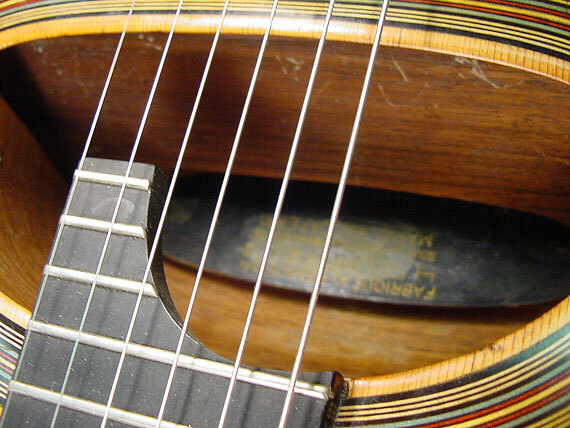 Likewise, the "zero fret" or "fret nut" is often associated with inexpensive instruments. It's not necessarily a cheaper way to make a guitar, and it is the way Selmer did it, so it's the way virtually all replicas are made, too. 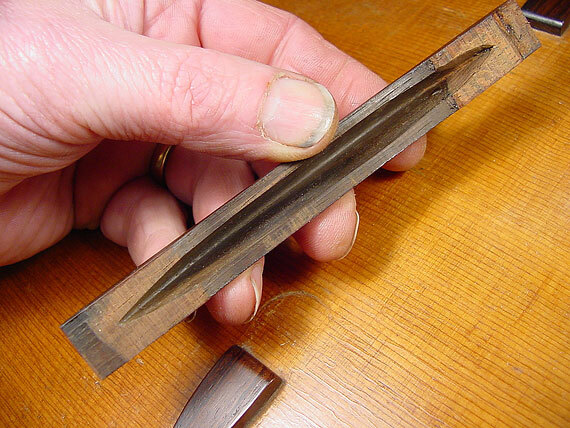 Detractors of the zero fret often cite the fact that it is a way to escape setting the height of the nut by avoiding the hand filing of each groove. In skilled hands, action setting at the nut takes only a few moments, so there really isn't all that much of a labor savings. Here's a thought: There's a lot of downward string pressure at the nut on any steel strung guitar with a slotted peghead. So, the metal bearing surface at the zero fret allows the string to slide over the nut more smoothly so the string doesn't "jump" or "ping" as it's tuned up. The bone nut only acts as a guide for spacing the strings and doesn't bear much load, so the string has far less tendency to settle into the bone and deform the bottom of the slots as it would in a traditional Martin design. As with so many other things, there's a down side, too. 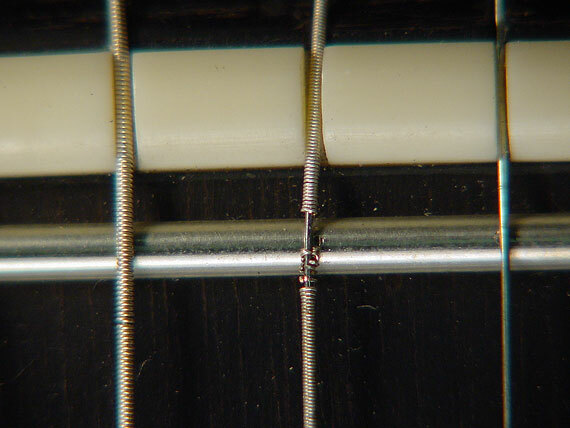 String windings are more likely to be damaged by the harder material of the zero fret than by a traditional bone nut. Check out the underside of the standard bridge. It's hollowed out, reducing the mass, improving tone and volume. Also, the hollow structure makes it easier for the luthier to fit the bridge precisely to the top. The center section of the bridge is held in place by string tension and may be moved around to achieve correct intonation. 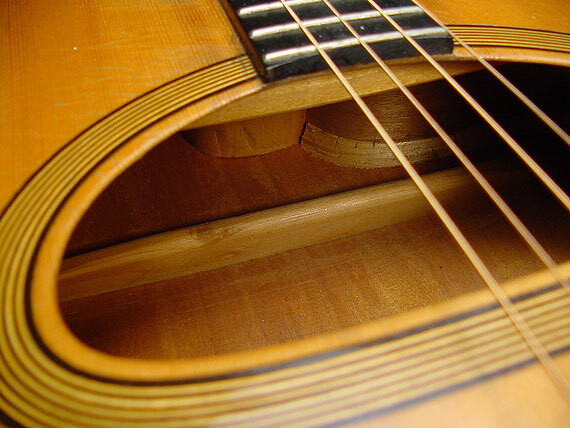 A moveable bridge is a real advantage, and is common to all archtop acoustic instruments. Unlike the heavier acoustic f-hole jazz guitar with its heavier stringing, the Selmer style instrument never has an adjustable bridge. The bridge is a bit low to accept the adjusting hardware,the mass of which would mute the tone - particularly bass response. 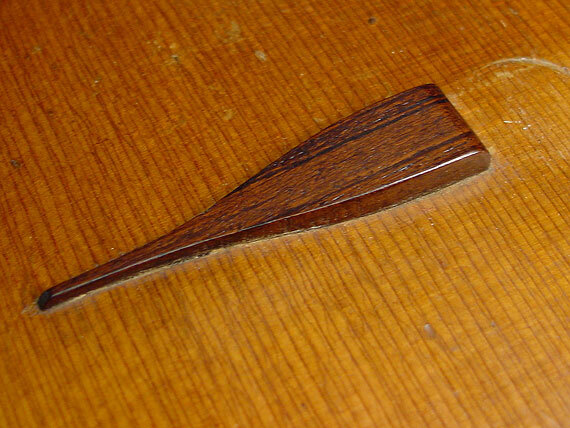 By the way, the little decorative "wings" are just that, a tip of the hat to centuries earlier guitar designs. 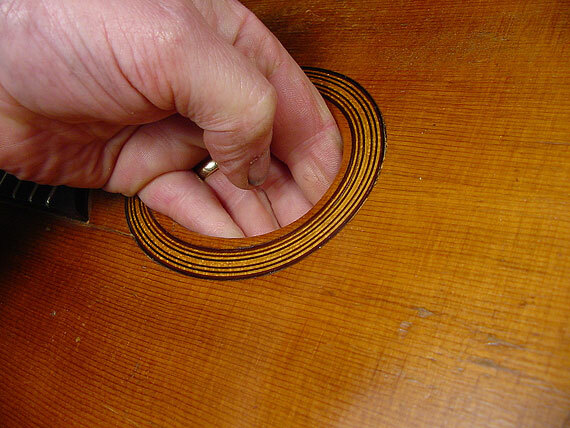 Many modern makers use some of the finest solid hardwoods for the backs and sides of their Macafferri style guitars, although the originals were laminated (except the tops, of course). 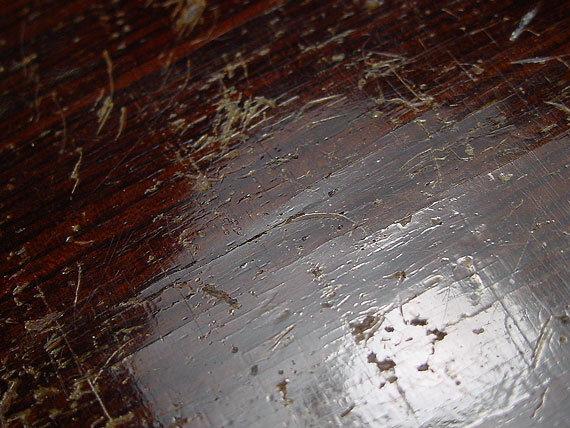 Here, you can see the result of checking and delamination in the back of a rosewood Selmer. In reflected light, you can often see myriad tiny veneer and finish cracks. Such cracks have no structural importance and seldom endanger the life or tone of an instrument. They can look pretty bad, though, and may necessitate some pretty serious corrective cosmetic work. 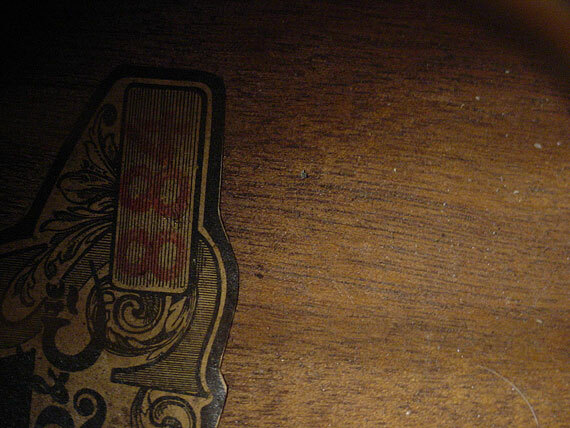 Inside the same rosewood guitar, you can see the innermost layer is actually mahogany. Clearly there was no attempt to disguise the use of laminated materials. In fact, the reason for using laminated backs and sides may not have been a matter of economy. We'd probably have to ask Mr. Macafferri about that. 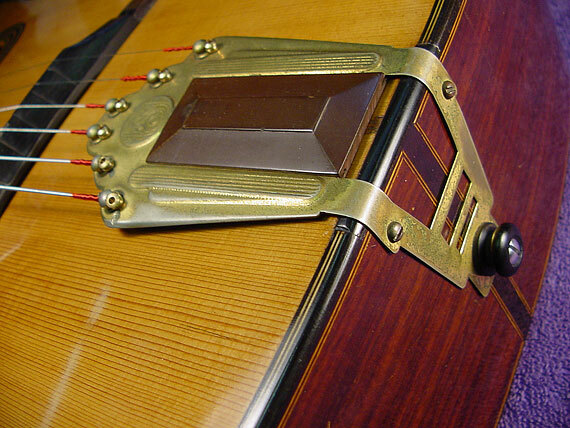 Here we arrive at the bottom end of the guitar, where the tailpiece attaches. These guitars have very light stamped brass tailpieces, which are rather easily damaged by bending. Most builders add a bit of resilient material under the tailpiece where it bends over the body to cut down the possibility of rattles. If you're tempted to do this yourself, it's a good idea to loosen the screws to slip a thin strip of leather or felt underneath the tailpiece. 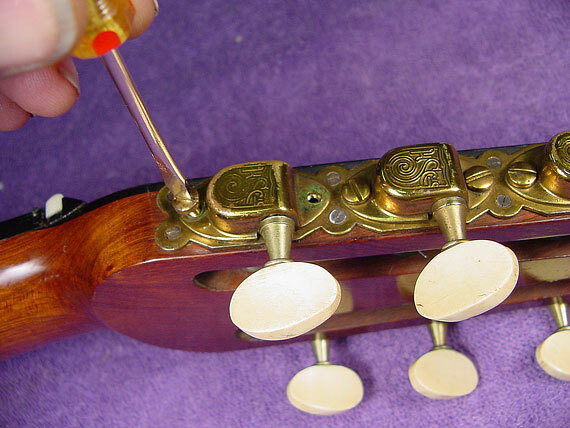 In an situation, resist the temptation to bend the tailpiece upward - brass really doesn't like to be bent and rebent.